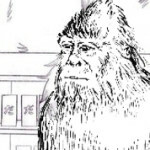 Retail finance learnings reached unexpected heights when a Bigfoot took over a Coma business seminar. About eight minutes into a webinar for Coma businesses titled “Maximizing Retail Finance Opportunities” several halting screams interrupted a presentation by local businessman Bob Smith-Smith. An extended series of clicks, grunts and whirling sounds followed. Prepare your PC to be blown away by the webinar ninja pictured here. The Sasquatch worked his way through the remaining 57 slides in Smith-Smith’s power point presentation. 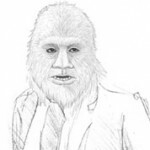 One participant in the webinar was upset that the Bigfoot unleashed a series barking-snarls whenever late attendees loudly logged on after the conference call started. But others appreciated the generally smooth-flowing nature of the presentation. Others were more outspoken in their praise. The biggest complaint of attendees was that the call suddenly ended seven minutes early when it appeared the Sasquatch inadvertently hung up on himself. 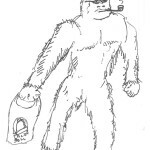 Does a Sasquatch Frequent the Coma Taco Bell?